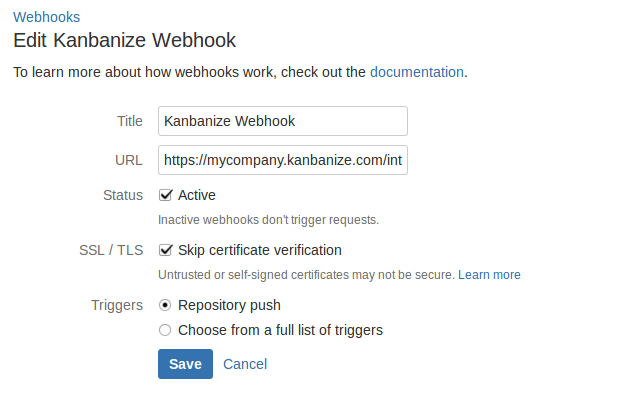 The integration is in one direction only – from Bitbucket to Kanbanize. For example, when an issue is closed, the corresponding Kanbanize card is moved to Done but moving a card to Done in Kanbanize will not get the issue closed in Bitbucket. 2. Enable the integration and select a Kanbanize user on whose behalf the action will be performed. And you are good to go! From now on, every commit message will be processed in Kanbanize and your changes will be reflected on the corresponding Kanban card. When a local branch is pushed to a repository all local commits will also be processed one by one.